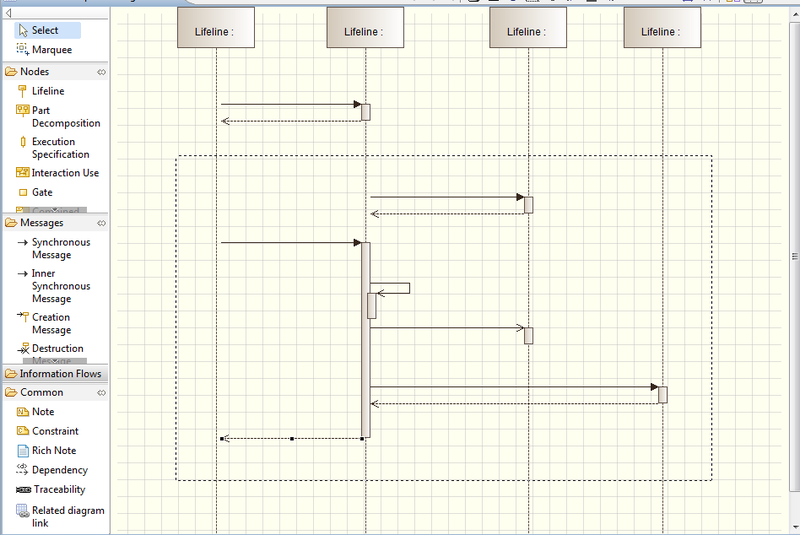 Once I start working on a sequence diagram, I often find that I want to add more detail in the middle of a sequence. This usually involves moving stuff downwards to make more space. I usually find myself going through a bunch of elements and moving them down individually. Worse, I have some messages which I can't move down at all! 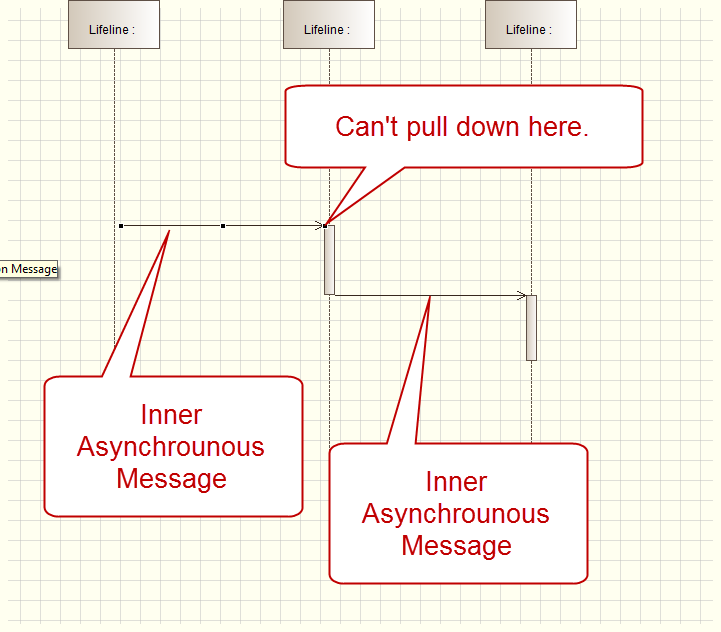 I think I defined these as "inner asynchronous messages". When I try to drag the arrow head down, it simply shows a no-entry sign. Is there a solution to this? 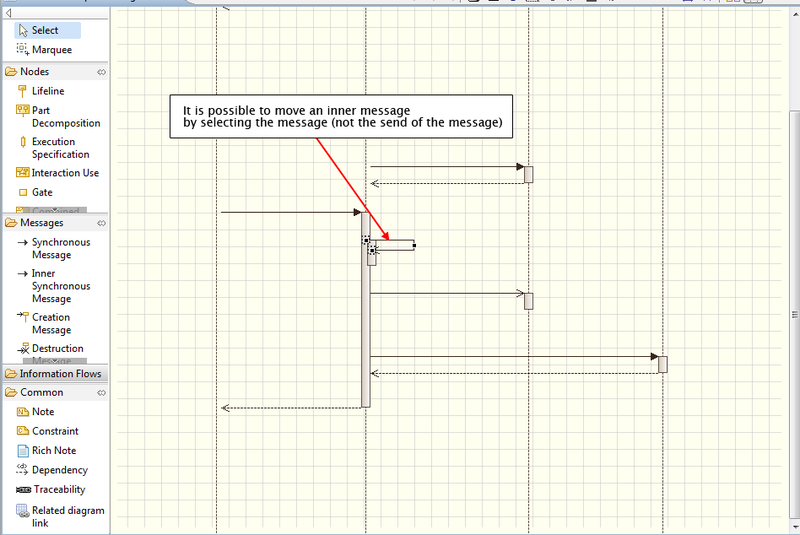 What I really need is a function where I select a horizontal position in the sequence diagram and insert more space by moving everything below the line downwards. You can move several element at the same time. You can select several elements easily by using the technique of the "lasso". Put your mouse to the top left of the elements you want to select then drag a rectangle down to the right until all the elements you want to move are selected (in the same way as on Windows to select several files). 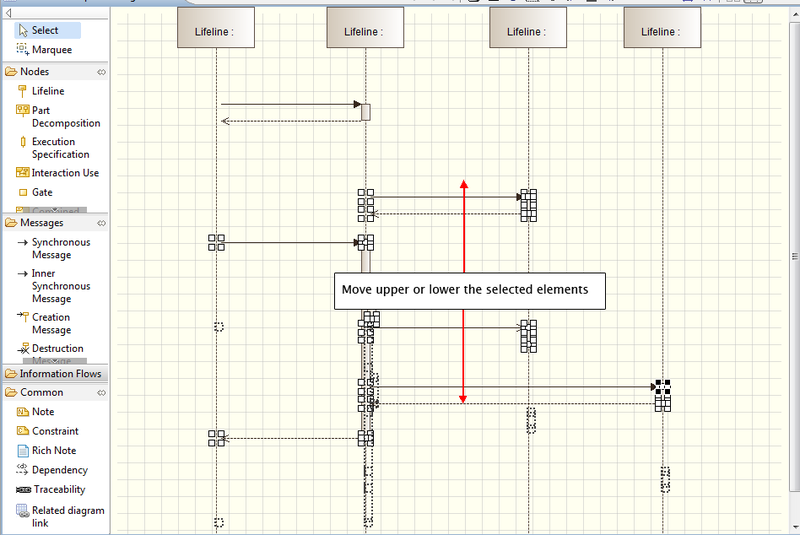 With your mouse drag and drop the selected elements upper or lower. Concerning the problem of dragging the arrow down, you can simply select the message to move it. 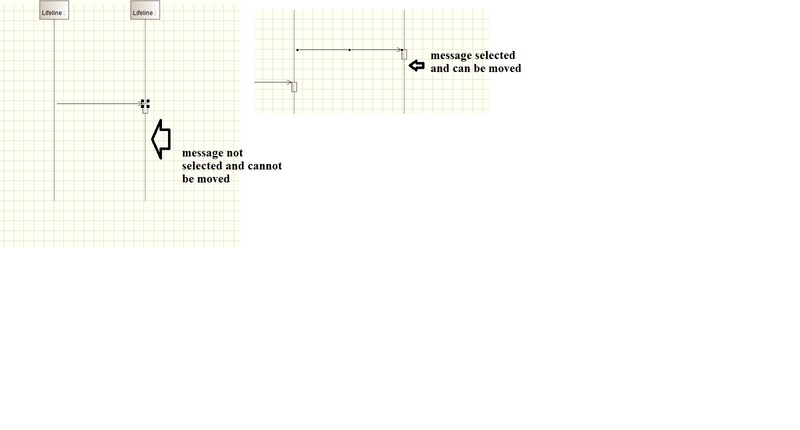 This is 2 screenshots showing what must be selected in order to move a message (inner or not). Below this is an example with an inner message. Last Edit: 5 years 4 months ago by pan. I understand that I can 'lasso' multiple items, but in practice I often find that I cannot move them down, because 'forbidden' icon appears. This appears to be related to elements that I have defined as Inner Asynchronous messages. then I cannot pull the first one down. I see. It's a specific scenario. It seems that it only happens if the next message starts from the end of the Execution Specification. There is the same behavior with asynchronous messages. It is a bug. Feel free to report an issue in the forge so you will be notified when this issue will be corrected. I have the same problem. In addition there is a "concurrent modification exception" behind the "message travels back in time" dialog. The forge is not reachable, so I can't report it there. I created issue 316 for this.